Mammalian organisms are exposed to millions of potential pathogens daily. Their ability to avoid infection depends on two systems that work in concert, the innate and the adaptive immune systems. Antigen-presenting cells activating adaptive immune system. During the first hours or days of exposure to a pathogen, nonspecific defense mechanisms come into play. This immune response is called innate immunity as it is not specific to a particular pathogen and it is triggered very quickly. This line of defense includes physical barriers such skin and mucosa, anti-microbial chemicals in the blood, and specialized cells that can attack the incoming pathogens. In contrast, the adaptive immune response is more complex and specific. During the first days of infection, specialized cells process and present foreign antigens to the adaptive immune system. Once a specific antigen has been recognized, the adaptive immune system uses a complex network of cells and molecules to specifically attack pathogens expressing this antigen. The cells activated during this process will expand and give rise to “memory” cells that can quickly recognize the same antigens if the organism is infected by the pathogen again. Click on different properties to create a custom filtered list of immunology constructs in Addgene's collection. Currently, no available constructs with those features. 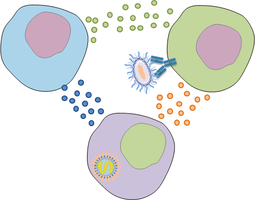 Cytokines and chemokines play an important role in cell communication during the course of an immune response against pathogens. Cytokines and chemokines can attract cells to the site of infection, activate them, and then help adaptive immune cells control the immune response. 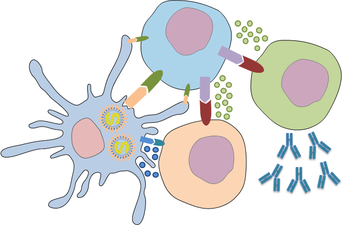 Cytokines and chemokines play a key role in and are messengers between the innate and adaptive immune responses. Sort or search to create a custom list of immunology constructs in Addgene's collection. 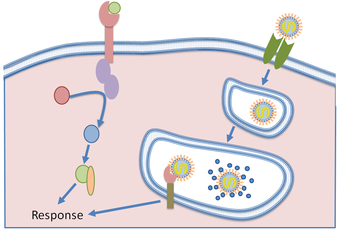 During an immune response, several intracellular processes are activated leading to the development of a response against pathogens. Kinases, adaptors, and transcription factors trigger the expression of cytokines, chemokines, or molecules involved in cells migration, phagocytosis, and antigen presentation. Human Kinase ORF Kit: 558 distinct human kinases and kinase-related protein Open Reading Frames (ORFs) in pDONR-223 Gateway® Entry vectors from the labs of William Hahn and David Root. Multiple Lentiviral Expression (MuLE) System Kit : A modular and flexible system that can be used to construct complex lentiviruses for modification of mammalian cells with a single viral infection from the lab of Ian Frew. MXS Chaining Kit: From the lab of Pierre Neveu, the MXS-chaining system allows efficient assembly of constructs that are optimized for synthetic biology applications in mammalian systems. The MXS-chaining kit includes chaining vectors with multiple cloning sites and standardized building blocks: 14 different fluorescent proteins, 10 mammalian promoters and enhancers, 3 polyA signals as well as selection cassettes and tools for inducible gene expression. Myristoylated Kinase Kit: Consists of 190 human kinases and kinase-related open reading frames (ORFs) cloned into a retroviral vector which adds a myristoylation sequence and flag-epitope tag to each ORF from the labs of William Hahn and Jean Zhao.